Pine Beach Camp in the Adirondack Park of New York sits on one of the most exclusive sand beaches in the Champlain Valley. The quarter mile beach is bounded by the mouth of the Ausable River to the North and a cliff to the South and is only accessible by a private gravel road. The lake bottom is sandy and most residents walk around and enter the water with bare feet. Boats can be moored offshore within walking distance or pulled up on the beach. There is plenty to see and do from this location. Float a kayak, paddle board or row boat out on the lake or up the lazy Ausable River, go swimming, fishing or just relax on the patio or beach. At night, sit around a campfire on the beach and roast marshmallows. The location is also a perfect base from which to explore the ruggedly beautiful Adirondack Mountains. Lake Placid, site of the 1980 Olympic Games and in the heart of the Adirondacks is 39 miles away. Downtown Burlington, VT is a 1 hour ferry ride from Port Kent, NY (ferry accepts cars). From Burlington, the most scenic vistas Vermont has to offer are only a short drive away. The Amtrack Train station in Port Kent also provides access to and from Penn Station in NY as well as Montreal. Three public golf courses are located with in 8 miles with the nearest course within 3 miles. Ausable Chasm, a popular tourist attraction is only 3 miles distance. The camp is well equipped and includes a washer and dryer. There is a bathroom on each level. Towels are available for guest use. If towels are used they must be washed, dried, folded and returned to the location where they were found on arrival. Plattsburgh and Lake Placid in NY State both have quaint downtown shopping. Burlington, VT is a 1 hour ferry ride away. Downtown Montreal is a 2 hour drive. Plattsburgh, NY is the nearest (small) city (about 14 miles away). The Villages of Keesville and Port Kent, NY are less than 15 minutes away. 100 feet of fine sand beach that gently slopes into the water. Clear water is relatively shallow for 20 yards. Most residents walk the distance to moored boats. Three golf courses within 8 miles. Port Kent Golf Course is only 3 miles away. Bluff Point Golf Club and Resort and Adirondack Golf and Country Club are both only 8 miles away. Views of the Green Mountains of Vermont with Lake Champlain in the foreground. Look across 12 miles of Lake Champlain with the Green Mountains of Vermont in the background. If linens are used they must be washed, dried, folded and returned to the storage area where they were found prior to departure. Located in separate laundry room area. Garage is storage for kayaks, bikes, paddleboard and other accessories and is not available for vehicles. If towels are used they must be washed, dried, folded and returned to the storage area where they were found prior to departure. Fireplace located in living room. Many of the basic condiments are provided. 2 sea kayaks (each is a two-person boat) and 1 stand-up paddle board available for use. small row boat with oars available for use. Patio on lake side of camp with sand all around. This place was great - the views of the lake and Green Mountains is spectacular. The place is quite large but has the feeling of a real lake camp. On an extensive sand beach as well, and right next to AuSable March Wildlife Preserve, which made from some really nice kayaking. Karol gave us all of the info we needed and was very helpful. All around great! We really enjoyed our stay. The house was very cute and pretty comfortable. There is plenty to do in the surrounding areas. We stayed in October so it was a little too cold to get the boats out, but there were multiple crafts to choose from if we wanted them. The views over the lake at sunrise and sunset are breathtaking. We had a chance to meet the owners as well and they are super friendly and welcoming. The only thing I can think of that was a little disappointing is the wifi was a little too slow to stream, but given the relatively remote location it's not unexpected - at least there was something for basic internet use! We would absolutely consider staying here again if we ever wanted to visit the area again! Great views, great value property!! Sandy beach with more than 180 degree views across lake Champlain make the property an ideal get-away location!!! 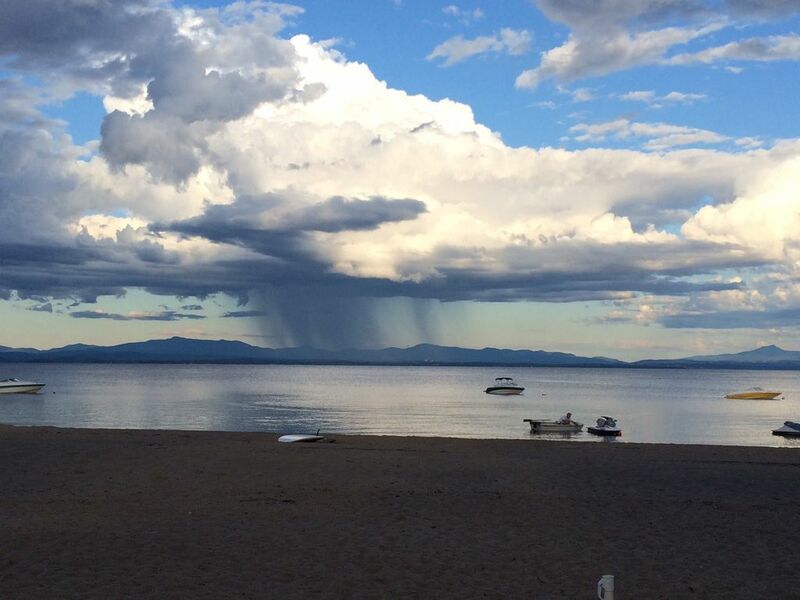 The location and views of Lake Champlain can't be beat. The home is on a quiet street with no traffic. The lake views are beautiful. The home came with a paddle board and 2 kayaks, as well as bicycles which were fun. Fire pits at night right on the beach were so relaxing. Home is rustic but they call it a "camp" and you get that feeling...like your camping but better. Wifi was slow but hey we were looking to disconnect. I would stay again. We couldn't have asked for a better vacation! The camp and beach area are perfect and the camp is completely stocked with anything you might need - comfortable accommodations, a great outside space, and a perfect sunrise each morning! Karol is easy to contact, quick to respond and very attentive to needs or questions - the whole experience was a pleasure! We had a great time. Enjoyed the large waterfront beach. The house had everything we needed and the view was great. Beach could use a little raking/cleanup and a little tlc around the house but overall a good summertime location. Perfect spot for after dinner fires near the water... very relaxing. Bonfires on the beach are allowed in the evenings. Ausable Chasm is a walk along a the Ausable River Chasm and ends with a short river raft ride to the end. There are also mountain bike trails and disc golf at Ausable Chasm. Loads of beautiful hiking trails and mountain climbing in the Adirondack Park. There are no cleaning or house keeping services so cottage must be left in a clean and organized condition for the next arriving guests. Linens and towels are folded and available for use by guests. If used, they must me washed, dried, folded and returned to the location in which they were found. No smoking inside the camp.